Jesus tells a blunt story about sin in Luke 15:11-32. A young man says to his father, “I wish you were dead. I need to get out of this place and become my own man. Give me my inheritance and we’ll be good.” Three sins occur in this event: first against the young man sins against the moral values of his village. Second, he sins against his parents, that is, the relationship that he was commanded by God when He spoke through Moses saying, “Honor you father and your mother.” Regarding these first two sins, Jesus would be the first to grant a deferment to the youth if the reason for his trip was to fulfill his inner calling or to come and be a disciple of the Lord. But alas, the kid only wanted to get away to chase fast women and drink sloe gin. The third sin committed that day is one that Jesus never grants us a deferment from; the calling to be compassionate to the people around us. Young people grow into an ever-widening circle of people for whom they must show love and compassion. First it is their siblings and parents, then their playmates, then the people at school, especially those who are being bullied or ostracized. As we enter into adulthood, our calling to compassion must extend to those who are poor, or subject to abuse. The circle widens out, as it becomes for us sin to exclude those who come to our shores because of famine, persecution, or conflict in another land. Jesus challenges us to love even our enemy. To do less, is sin. The second form of sin, however, does not relate to the blunt rebuke of the physical world (as in the hangovers one receives from too much gin) or the imperfect laws of society (which often locks up the innocent). It relates to the ought-ness of family relationship. We ought to love our spouse and those in our immediate family, even when they bring pain into our lives. It is hard to make much progress in the rest of life, or spiritually, until we resolve to the best of our ability, the relationships we have with those nearest to us. Like Dorothy in the Wizard of Oz, we each have a Kansas of the heart. 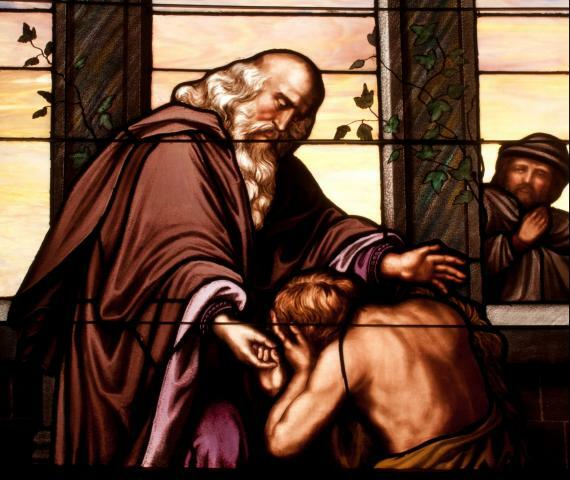 Here the prodigal son may have had the most justification to break God’s laws. Here he is most subtly and completely punished. Strangers treat him worse than his family ever did. Yet when he does return, he receives grace upon grace. About the third sin, earth offers no escape and heaven no place to hide. If we fail to develop ever-widening circles of compassion as we mature, then we will become narrow and bitter people. If we fail to love, we will die alone; and according to my theology, live on beyond death in the torment of regret.